-I just remembered that I haven't listened to Maggie read from Forever. Go here to check it out! I need to do that ASAP! OMG! YES! I want to know how this series is all going to end! And I want to know now!! I want to know how this is going to end too! I didn't love Linger like I thought I would, but I'm still invested in the characters. I haven't listened to the excerpt from Forever, but I hear there's a surprise included in there, so I'm not sure if I want to know now, or if I should just wait for the book! This was my pick last week and I can't wait for it! Oh, I can't wait for this book to finally be released!! Great pick! I haven't read Linger yet, but I have been meaning to. I made the mistake of bringing my copy to my classroom and all of my students have been borrowing it! 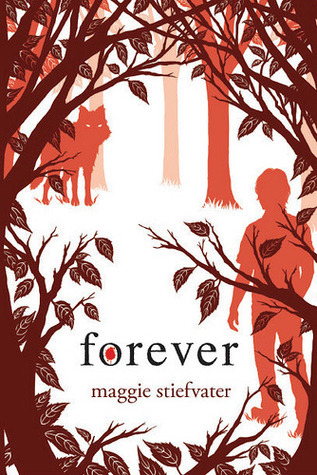 I need to read it soon so I can get my hands on a copy of Forever this summer. Great pick, I am looking forward to this one as well! Shiver has to be the one book that I've read in which I didn't want any sequels. I loved the story so much that I like to pretend it ended there. That is why I haven't read Linger yet. I'm afraid to be disappointed. But as soon as Forever is released, I will give them a go. I still need to read Linger! It looks at me with sad puppy eyes whenever I enter the store. Maybe I can get it next time I go. Can't wait for this one, I love this series!!! I can't wait to read the previous one!!! Great pick! i still need to read the first one lol!! I haven't read this series. I do however like the covers. I may have to rethink reading these books as they are so popular. Hope you enjoy it. I would kill for this book!! Well, ok..that's a little extreme, but still...it's FOREVER!! Great pick! Hope you get a chance to stop by Gone with the Words and check out what I'm Waiting On this Wednesday!! Unfortunately I couldn't even finish the first book, but I hope the conclusion to the series lives up to all of your expectations! I do love these covers though. Great Choice, I can't wait for this one! Simply amazing. Breathtaking and filled with action. A real page turner, and yet I do not wish for more. The final book has finally truly ended this series. And let it stay that way.